We develop knowledge-based technologies that allow humans and computers to deal better with the artificial world that surrounds us. A team consisting of EPFL researchers Naman Goel, Diego Antognini and Boi Faltings, together with 2 EPFL students, won several awards in the Geopolitical Forecasting Challenge organized by the US IARPA. 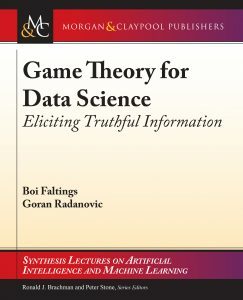 The book “Game theory for data science: eliciting truthful information” is now appearing at Morgan Claypool publishers. The techniques for session-based recommendation using Bayesian Variable-order Markov Models, developed at LIA, are integrated into the recommendation system of Prediggo SA and often more than double sales.